The Northern Highlands is quite a large and diverse region with some of the cities on very high altitude and others in a milder climate. Huaraz is the capital of hiking in Peru but not that often visited meaning that the hotel offer here is limited. Nevertheless the hotels used are good quality standard hotels. 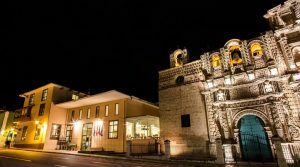 Cajamarca is gaining importance as the historic second Inca capital in Peru and therefore started attracting more local owned hotel chains that offer modern hotels with good services. 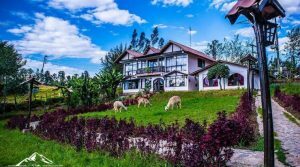 Chachapoyas is a quaint, sleepy town with a limited choice of (higher end) hotels but in the surroundings one can find some amazing countryside hotels with the Gocta Lodge being the most impressive one. 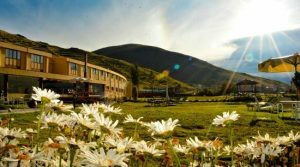 Located in the center of the town of Huaraz the El Tumi Hotel provides standard and superior accommodations for its guests. 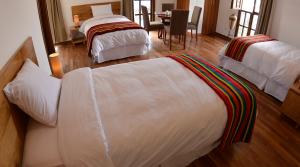 Warm, cozy rooms provide a good night’s rest during your time in the hiking capital of Peru. 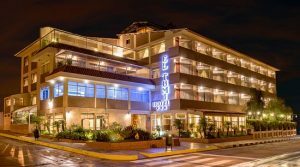 The Costa del Sol Cajamarca Hotel is located in the heart of town and provides modern rooms with all comforts. The hotel also provides a small pool, gym, Spa and business center for its guests. The unique Gocta Lodge is located in the small town of Cocachimba and the main character of the lodge is one of the highest falls in the world; the Gocta Fall. 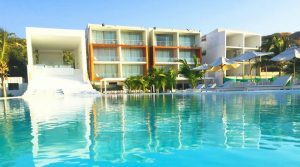 The Fall can be seen from every angle and room of the hotel but is most enjoyed from the fabulous infinity pool in the large gardens of the hotel. 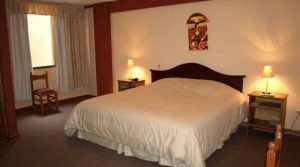 The Aurora Hotel in Huaraz provides simple, clean but well equipped rooms combined with a central location in the city. This colonial style hotel, located in the center of Cajamarca provides a great base to discover the city and surrounding area. 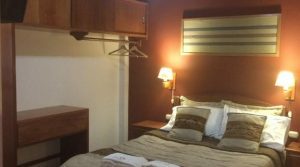 Warm and cozy rooms provide all necessities for your stay in Cajamarca. 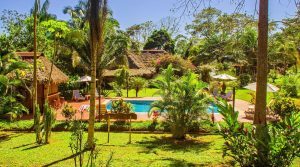 Located on the outskirts of town this colonial style hotel is housed in a countryside house featuring nice gardens, a swimming pool and restaurant. The quiet rooms, some with private balcony, allow you to enjoy the peacefulness of the area. This simple, clean hotel in the center of Huaraz makes for a good quality night’s rest in this city in the highlands. Some of the rooms have mountain views. 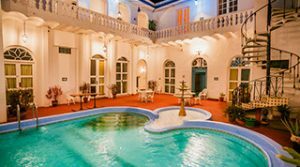 At three blocks from the main square in Cajamarca one can find the Casa Bonita Hotel. 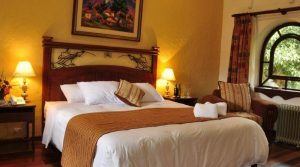 This colonial style hotel enjoys simple, clean rooms with all basic necessities. The quiet patio makes for a good place to unwind and plan your next days. La Casona de Monsante is located on the main pedestrian street of town, two blocks from the main square. Housed in a beautiful colonial house with nice patios the hotel will serve as a great base for your explorations in and around Chachapoyas. The Peruvian South Coast is made up out of different cities, Paracas, Ica and Nazca being the most important ones. All of these have a reasonable hotel portfolio on offer but the higher end hotels are located mostly in Paracas. Ica and Huacachina have several hotels but in Huacachina the main focus is on lower end hotels. Nazca is a city most people pass through and only spend the day or one night. Therefore there are some good quality 3* hotels but higher end properties are not available here. With great weather all year round (only Paracas can get a little colder in wintertime) hotels on the South Coast should have a nice outdoors area and facilities such as swimming pool as well as other activities. Especially in the summer period it is important that hotels have good ventilation or air conditioning. A good hotel restaurant can also be a plus. Let us know if you would like to see some other recommendations for any specific area. 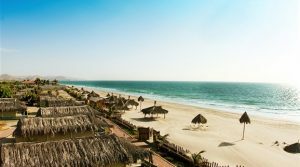 The 5* Libertador Paracas Hotel is located on the beach in the Bay of Paracas and enjoys ocean views from all over the hotel. 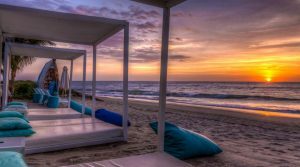 Spacious air conditioned rooms with private balconies or terraces, private beach, large outdoor pools, Spa, different watersports and gym will allow you to make the most out of your time in Paracas. 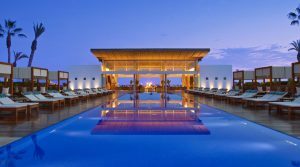 The Doubletree Paracas Hotel is located on the Bay of Paracas and provides a private beach as well as large gardens and outdoor pool. The hotel offers large rooms with view of the ocean or the gardens and private balconies or terraces. An onsite gym, watersports center, restaurant and bar will make sure that you will enjoy your stay here to the fullest. 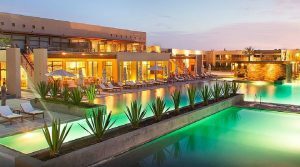 The Las Dunas Hotel is located on the outskirts of Ica and provides a hotel with huge grounds and a large selection of activities. 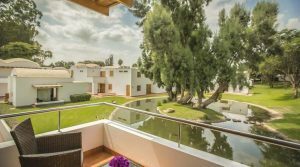 All spacious rooms are housed in low-rise buildings spread throughout large gardens and offer all necessary amenities as well as private terraces. The hotel has three pools, a Spa, gym and even several golf holes. 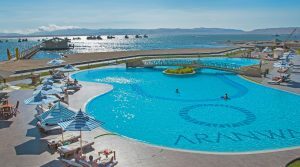 The Aranwa Paracas is located on the Bay of Paracas and provides modern and well equipped rooms with private balconies overlooking the bay. The hotel has a large outdoor swimming pool and gym as well as full Spa with saunas, massage rooms different kind of treatments. Villa Jazmin is a small boutique hotel on the outskirts of Ica and the border of the desert. 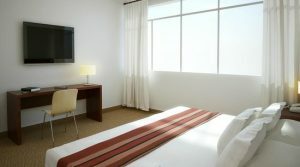 The hotel provides modern, clean and spacious, air conditioned rooms equipped with all necessary amenities. 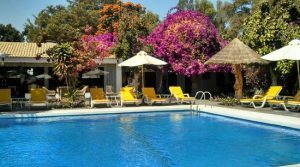 The hotel provides a small garden and two pools, a bar, restaurant and game room. 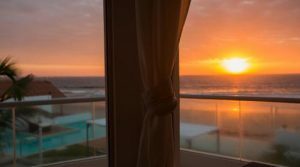 Located at the beach in the Bay of Paracas the San Agustin Paracas provides bright, clean rooms, all with views of the bay and private balcony or terraces. 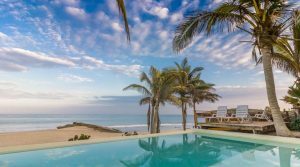 The large pool, private beach, bar and restaurant will immediately get you in holiday mode. 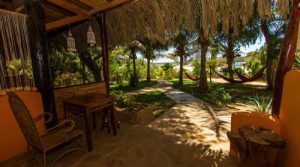 Located in the Oasis of Huacachina the Hosteria Suiza provides clean air conditioned rooms with balcony overlooking the swimming pool or neighboring huge sand dunes. 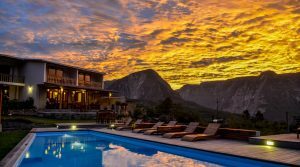 Located on the outskirts of Nazca in a green oasis in the middle of the desert the Hotel Majoro is an old Hacienda turned into a countryside hotel. Colonial rooms with terraces, large gardens and plenty of leisure activities such as swimming pool, tennis court and football field will make sure you can enjoy the warm climate of the region to the fullest. Iquitos is a large typical jungle city meaning with a hot and humid climate and in general quite some noise with the large number of moto taxis and outgoing local population. The city itself is quite large but most hotels in the city can be found around the Plaza de Armas and the boardwalk. 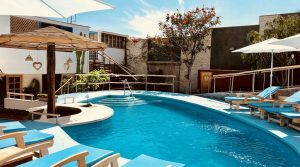 With the high humidity all year round it is important for hotels in Iquitos to offer either good ventilation or air conditioning as well as a swimming pool to relax during the hottest time of the day. The lodges in the Iquitos region are in general, compared to the lodges in the Tambopata area in South Peru, a little less equipped. This has mostly to do with the isolation of the lodges around Iquitos and logistical challenges. Most lodges are located at about 3-4 hours from the city by boat, a reason why we mostly recommend to have at least 4-5 days available for the jungle when visiting Iquitos. For less time, Tambopata may be more interesting. 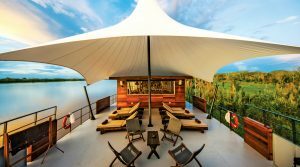 The Amazon River Cruises on the other hand provide all luxury and comfort one can hope for during such a high end cruise. 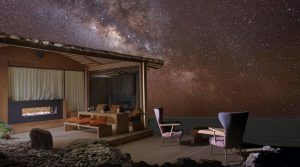 Air conditioned cabins, hot water showers, gourmet meals, cocktail bar and plunge pools…you name it. Delfin Cruises are among the top river cruises in the world and the most luxurious cruises available on the Amazon River. Three Delfin boats are available each with their distinctive character but with the same high end services, unique excursions and gourmet meals. All three cruises offer 3 or 4 night cruises with fixed departure dates. The other luxury cruise ship on the Amazon River is called the Aria and offers cruises of 3, 4 and 7 nights (fixed departure dates) allowing access to some of the more isolated areas on the Amazon River. Decorated by award winning architect Jordi Puig, this 45m (147ft) luxury ship provides everything you may need during your trip of a lifetime on the Amazon River. 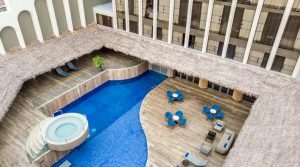 The Doubletree by Hilton is a recently completely renovated modern hotel on the main square of Iquitos. Air conditioned rooms either have view of the main square or swimming pool and provide all superior amenities and services needed. 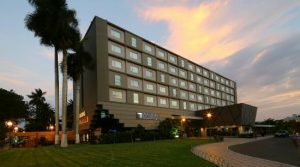 The hotel has a large outdoor pool and whirlpool to cool off from the heat as well as gym, gourmet restaurant and bar. 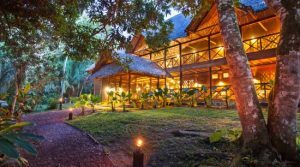 The Muyuna Lodge is one of the best lodges available for wildlife viewing, fishing and bird watching. Located close to the Pacaya-Samiria National Reserve, one of the biggest in Peru it takes about 3 hours in boat to get to the lodge from Iquitos. Traveling over the actual Amazon River and later on an affluent one finds this lodge next to a small village of San Juan de Yanayacu, a tribe with who the lodge cooperates. Activities go from piranha fishing to kayaking, night excursions by boat, longer hikes through the forest and even swimming with Pink Dolphins. The hotel La Casa de Morey is located in the city center of the city a couple of blocks from the main square. 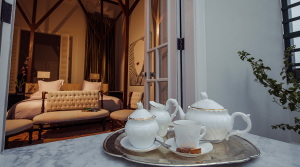 Located in a typical mansion from during the rubber boom in the 19th century, the hotel provides very spacious rooms with typical touches. Some rooms provide view on the Amazon River running in front of the hotel. 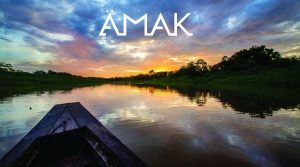 The relatively new Amak Iquitos Ecolodge is quickly establishing a name for themselves as another great option to get to know the Amazon River and Rainforest. 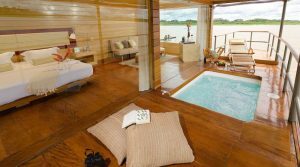 Located at about 1.5 hours in boat from the city of Iquitos the Amak Lodge provides private cabins with private bathrooms and comfortable common areas. 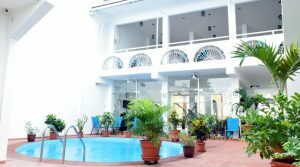 The hotel Garden House is located in the city center of Iquitos providing easy access to the different sights of the city. Clean, crisp, air conditioned rooms provide view on the common areas or the swimming pool. The Jacamar Lodge is located at about 2 hours downstream on the Amazon River from Iquitos and provide great access to the surrounding Amazon Rainforest. Daily activities can range from canoe trips, search for wildlife, fishing, hiking or visiting local communities in the jungle. Compared to some other countries with Amazon Rainforest, Peru has a great offer of local and ecological lodges located in the rainforest but still with good connectivity. This is especially true for the Tambopata National Park. 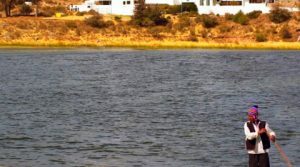 Located at about 1 hour in boat from the city of Puerto Maldonado the park has dozens of lodges for all types of budgets. 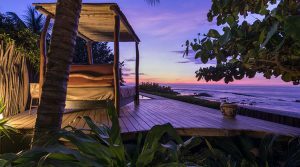 The lodges offer similar excursions but obviously the more expensive ones offer more inclusive excursions and special activities such as canopy walkways. Manu is somewhat more difficult to access as the only airstrip close to the park stopped operating some time ago. Nowadays the best access to Manu is via road from Cusco with the last part done in boat. It takes about 8 hours to get to the park from Cusco. For lodges we look for several qualities such as accessibility, diversity of the activities, the amenities of the cabins, comfortable and inviting common areas, quality of the food and of course the ecological efforts of the lodges. The beautiful Inkaterra Reserva Amazonica is one of the higher end lodges in the region giving you a great glimpse of what is life in the jungle like. Located on the left bank of the Madre de Dios River, about 1 hour in boat from Puerto Maldonado, this lodge provides large individual cabins with river or jungle view. 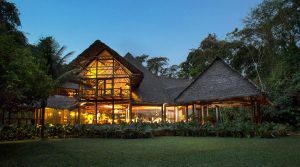 A beautiful main building, a canopy walkway and a la carte meals make a stay in this lodge an unforgettable experience. 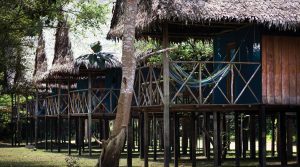 The lodge has also a treehouse available for those looking to spend a night in the canopy. 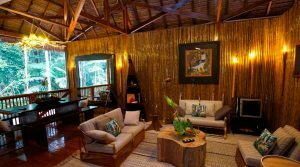 This small private lodge is part of the Refugio Amazonas Lodge but is slightly separated from the rest of the lodge and includes all top luxury services one can imagine in the jungle. A complete private cabin with sitting and dining area, large bedroom and bathroom with hot tub. The cabin even comes with TV with documentaries and a private porch with hammocks and grill. 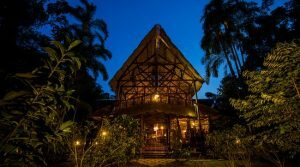 The second Inkaterra Lodge, the Hacienda Concepcion is located on the left bank of the Madre de Dios River and the main building is housed in a renovated large jungle cabin that used to be a medical outpost during the rubber boom. Close to the main building there are individual cabins with view on the forest or a small lake. Located close to lake Sandoval this lodge provides superior lodging and activities. The Refugio Amazonas is located on the Tambopata River about 3hours in boat from Puerto Maldonado. Due to its location deeper into the forest, this lodge provides excellent wildlife viewing opportunities without having to give up on certain comforts. The lodge provides different types of cabins but all according the same high standards. 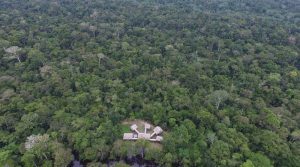 This lodge is also the last stop for the Tambopata Research Center even deeper in the Amazon and member of the same family of lodges. These lodges are known for its longstanding services, environmental efforts and professional guides allowing for a great introduction to the Amazon Rainforest. Also from the same family as the Refugio Amazonas, the Posada Amazonas is located on the Tambopata River at about 1.5 hours in boat from Puerto Maldonado. Its location allows for a great accessibility but without having to give in to the wildlife viewing opportunities. Standard, superior and deluxe accommodations are available at this lodge combined with great meals, interesting activities and the lush Amazon Rainforest. The Pantiacolla Lodge is located in the Manu National Park and can be reached by a two day excursion from Cusco. Manu National Park is one of the parks with the highest diversity in birds and reptiles in the world as well as several larger mammals living in its forests. This beautiful lodge allows you to explore this amazing park without having to give in too much on basic comforts. 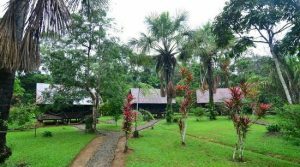 The Corto Maltes Lodge is located at about one hour from Puerto Maldonado on the banks of the Madre de Dios River. Great accessibility but with access to some great parts of the Rainforest. Visits to the Lake Sandoval, nearby cocha’s as well as parrot clay licks make that the activities offered will allow you to enjoy the jungle to the fullest. When not exploring you can take a dip in the swimming pool or sip your cold beverage at the shores of the river. 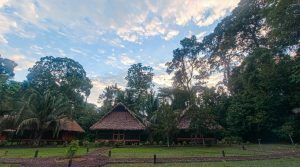 The Inkaterra Field Station is a relatively new lodge operated by Inkaterra and offers a more budget option for those looking to visit the jungle but want to make sure to have great professional guides and services. 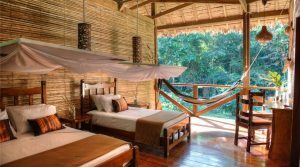 Located on the Madre de Dios River the lodge provides access to all the Inkaterra activities such as the canopy walkway as well as visiting the Lake Sandoval and other interesting places. Accommodations are in shared cabins of 4 or 8 people that offer individual sleeping spaces. Puno is the main city on the shores of Lake Titicaca and has a reasonable choice of hotels available. Most of the higher end Peruvian brands have a property in Puno as well as several interesting local establishments. 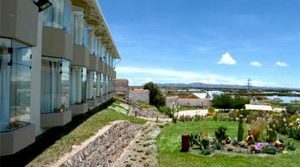 The higher end hotels are in general located at the shores of Lake Titicaca and other properties in the city center around the two main squares in town. There is also a handful of smaller properties that are located outside of town and even on some of the islands in the middle of the lake. The lakeside properties obviously have the best views and outdoor facilities to enjoy the lake. The hotels in town on the other hand have easy access to a very authentic highland city that is quite interesting to explore. From the center of town it is about 10 to 15 minutes’ walk to the pier and the lake. 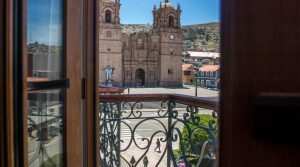 For hotels in Puno, apart from usual amenities, we look for hotels in the quieter parts of town and for the lakeside properties hotels with good restaurants as these have less access to the town of Puno. Another important feature is the heating. As the lake and its surroundings can become quite cold at night (you are at 3,800m (12,500ft) above sea level after all), good heating and isolation is important for a good night’s rest. This hotel member of the Libertador luxury chain is located on a private peninsula on the shores of Lake Titicaca. Surrounded by the fauna and flora of the peninsula this hotel provides you with 360º amazing views and unforgettable sunrise and sunsets. This Chateaux & Relais property is unique in South America. Located about 1 hour drive from Puno on a rocky peninsula on the shores of the lake, this hotel will allow you to grasp the lake and its surroundings to the fullest; 360º views, a boat house equipped for different water sports, evening bonfire’s at the shores of the lake what more could you wish for – Staying with the Titilaka Hotel includes all the daily activities, meals a la carte and drinks during your stay meaning you only have to worry about enjoying the lake, its culture and the amazing views. This 4* hotel is located outside town on the shores of the lake. The lake can be seen from most rooms, the common areas, the restaurant as well as the large gardens. At the private pier one can also find the Yavari, one of the largest commercial vessels that have sailed the lake and was brought piece by piece from England. The Casa Andina Premium Hotel is located at the shores of Lake Titicaca about 10 minutes out of town. Spacious rooms, most of which have lake views, comfortable common areas and nice gardens allow you to see and enjoy the lake throughout the day. 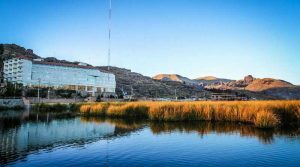 The Jose Antonio is located outside Puno en route to the border with Bolivia and provides modern spacious rooms with lake view. The hotel also has a bar and restaurant as well as nice gardens making it a great base for your lake explorations. This member of the Tierra Viva family is located on the Plaza de Armas in the center of town, 15 minutes from the lake shore. Modern rooms with all principal necessities will assure you have a pleasant stay. The Royal Inn is located on a quiet street just off the main square and provides a great base for those visiting the city and the lake. 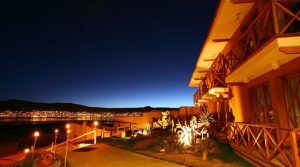 Before known as the Eco Inn the Xima Puno enjoys a great location on the shores of the lake only minutes from the city center. Spacious rooms, several with lake views will make sure that your stay at the lake will be a memorable one. 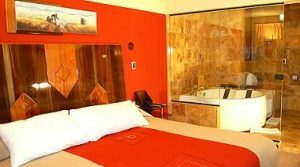 This simple, clean and centric 3* hotel provides spacious rooms with standard amenities for a good value allowing for a warm home during your time in Puno. 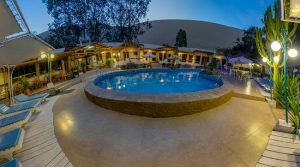 The Qelqatani is one of the longer standing 3* hotels in the city center and with their years of experience provide a great base for those visiting the lake. 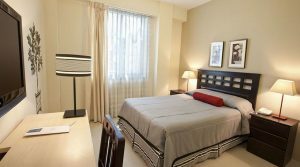 Located on the Plaza de Armas this nice 3* hotel is conveniently located to good restaurants in the city center at about 10-15 minutes’ walk from the lake. 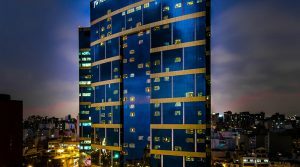 Lima is a city that in recent years has gained a lot more international prestige with its lively tourist scene, its culinary treats and business opportunities. Therefore it is no wonder that the hotel offer had to follow demand. 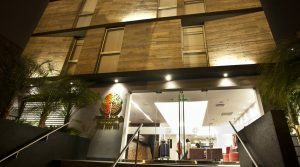 This makes that Lima has developed an interesting hotel portfolio with hotels ranking from the big brands to unique boutique hotels, good standard quality hotels as well as family apartments. 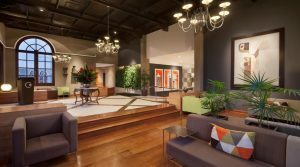 Most hotels are located in the commercial area of Miraflores, the artsy area of Barranco or in business driven San Isidro. 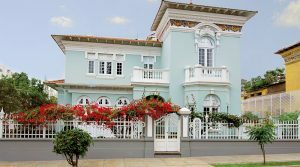 With great access to the Pacific Ocean, a lot of fabulous restaurants and overall entertainment we generally opt for hotels in Miraflores or Barranco. Both are neighboring areas but Miraflores is more modern and commercial meanwhile Barranco is somewhat smaller and more bohemian. 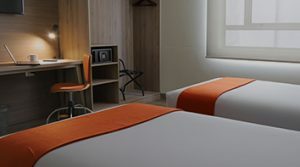 As Lima is a huge city and one does not want to spend more time in traffic then necessary, for Lima, apart from the standard amenities you would expect from each hotel in their category, we look for convenient and safe locations as well as good access to the culinary and other treats this city has to offer. 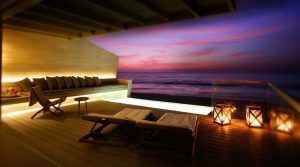 This top luxury Belmond property in Lima is located right on the Pacific Ocean and provides a modern type hotel with all luxury amenities one may need. 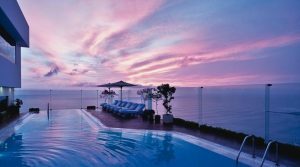 A rooftop infinity pool, Spa and gym as well as gourmet restaurants and cocktail bar. This Chateaux & Relais property is one of the finest boutique hotels in Peru. 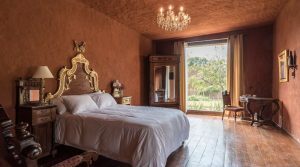 Housed in a belle-époque mansion in bohemian Barranco, the hotel, due to its exclusive collaboration with the Lucia de la Puente Art Gallery next door, allow Hotel B to be one of the few true art hotels on the continent. 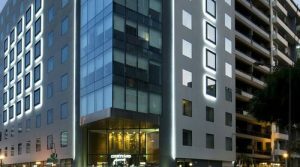 The Marriott Hotel Lima is located in one of the most famous buildings of Miraflores, right at the Pacific Ocean and the famous mall of Larco Mar. 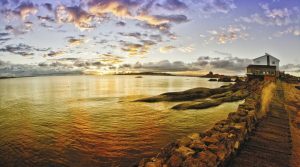 The hotel provides rooms with unparalleled sea views as well as excellent services. An outdoor pool, Spa and gym are all featured in this hotel. 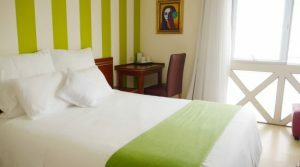 This 4* hotel is a favorite modern 4* hotel that provides excellent and professional services at a great rate. 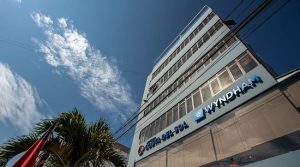 Located in the heart of Miraflores close both to the Pacific Ocean as well as the commercial heart of this upscale neighborhood, the hotel provides a great base from where you can discover Lima. 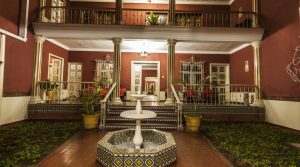 This beautiful boutique hotel is located in the bohemian seaside neighborhood of Barranco. 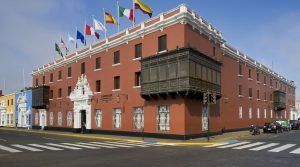 The hotel is housed in a colonial mansion, typical for the district and provides a great warm and cozy home for your time in Lima. 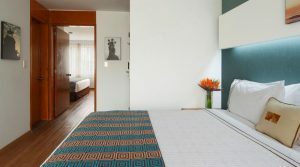 This modern hotel is a relatively new hotel in Miraflores and provides spacious, impeccable rooms with all modern comforts. Located on walking distance from most attractions as well as great restaurants and bars in the area. 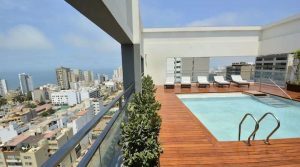 This member of the Tierra Viva family is located on the Larco Avenue in central Miraflores, the most important residential and commercial area in Lima. Located on walking distance from great restaurants and bars as well as most local attractions this is one of our preferred hotels in its class. 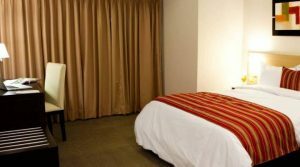 The Sonesta Posadas del Inca is located a couple of blocks from Kennedy Park and on walking distance from all mayor attractions and best restaurants in the district. Modern rooms with all services needed will make this a good to place to start your Lima exploration. The Allpa Hotel & Suites is located two blocks from Kennedy Park and provides a great base to get to know this city. Great restaurants around the corner and lots of things to do in the area. 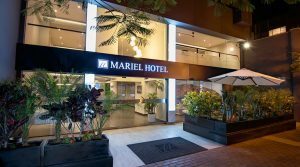 The Mariel Hotel is located across from the artisan market in Miraflores and as you would suspect close to most attractions in the district. Modern rooms allow travelers to unwind between their travels and enjoy this part of town. 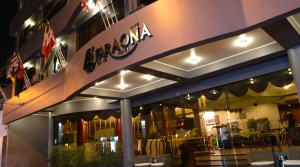 The Faraona Grand Hotel is located a couple of blocks from Kennedy Park allowing you to explore the district on foot. Besides its practical location the rooms are spacious and clean and the hotel also has a rooftop pool for its guests. The Sacred Valley with its mild climate and sunny days is made to enjoy outdoors. This is the reason most hotels in the valley have large gardens and a lot of outdoor facilities. Sure it can also rain in the valley so a good room equipment is also important for the hotels here. 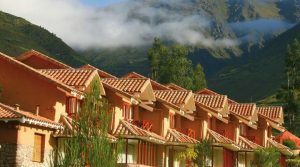 For some of the main factors looking at for hotels in the Sacred Valley are; the open air facilities & views and the gastronomic options. As mentioned the Sacred Valley is made to enjoy outdoors. Therefore we find it important that the hotels we use have some garden or outdoors where out travelers can relax and unwind. As some hotels in the Sacred Valley are located in small villages or by itself in the countryside we feel that these hotels should have a good restaurant. If this would not be the case a town with restaurants has to be close by – preferably on walking distance. 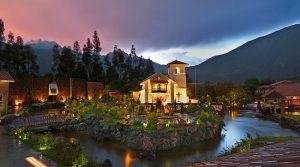 Here is a partial list of some of our favorite Sacred Valley Hotels. Let us know if you would like any specific recommendations for any of the towns in the Sacred Valley. This luxury property is located outside the town of Huayllabamba and provides a beautiful place to enjoy the valley. The individual cabins located in large gardens behind a beautiful main building are located slightly uphill allowing for some great views and to enjoy the sunset or sunrise from your private balcony. 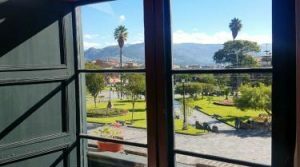 Also located in Huayllabamba this beautiful hotel is located around an old hacienda and Andean chapel and provides both colonial as well as modern style rooms. On the hotel grounds we also find a complete Spa, gym, outdoor swimming pool, outdoor Jacuzzi, cinema, art gallery and orchid house. 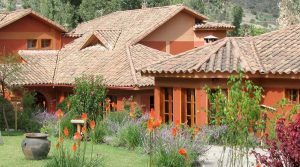 This Chateaux & Relais property is beautifully located in the Sacred Valley in different spacious cabins spread over lush green gardens. The hotel provides a gourmet restaurant, outdoor swimming pool and small Spa as well as the great service the hotel is so known for. This hotel is located in the quaint town of Yucay in the heart of the valley. Next to a beautiful old square this hotel is housed in a former monastery and some of the rooms are located in this building full of history. 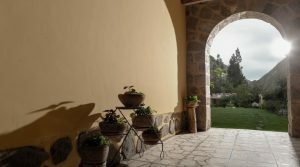 The hotel has large beautiful gardens with some Inca terracing and even an actual chapel. Two in house restaurants, a bar and coffee shop make sure that all guests several options for the inner self as well. 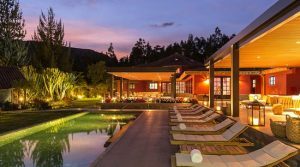 Located in the town of Yanahuara, this 4* hotel provides a beautiful hotel to enjoy the perks of the Sacred Valley; green nature, tranquility and lovely views will all be features of your stay at this Sacred Valley Hotel. Rooms are equipped with all amenities and have a private balcony to enjoy the surroundings to the fullest. Probably the only 1000 star hotel in Peru. These glass pods are suspended against a mountain wall in the Sacred Valley about 120 meters above the valley floor. 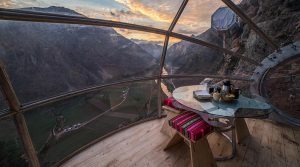 Each pod can hold up to 4 passengers who will enjoy a 360º view of the Sacred Valley and the sky above. Equipped with all basic necessities and private deck on top of the pod this is truly a unique experience. 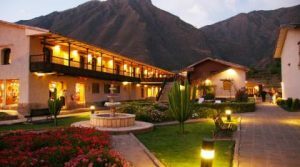 Located on the road to the train station in Ollantaytambo this hotel makes for a great base in the Sacred Valley. Having the quaint town of Ollantaytambo to enjoy and the accessibility of the trains to Machu Picchu. Beautiful gardens allow for some great views of the surroundings. The Albergue Hotel is located in the old train station building in Ollantaytambo and therefore provides the ideal stop before your trip to Machu Picchu. This cozy hotel has a nice garden and clean, warm rooms with excellent services. The hotel also boasts a great restaurant for guests as non-guests. 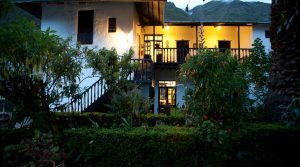 On the outskirts of Urubamba, about 10 minutes from the main road this hotel provides large rooms located in several buildings spread out over the beautiful gardens with views on the valley. All rooms have a private balcony allowing to absorb the valley and its views. The new hotel Miranda is located in the heart of Ollantaytambo between the bridge and the main square. Only 10 minutes from the station this hotels is a great hotel to end your day in the valley and start you day to Machu Picchu the next. 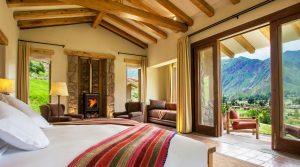 Some rooms offer views of the Ollantaytambo ruins. 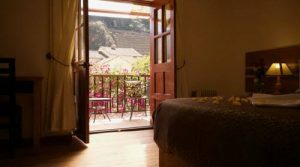 This hotel located at the bridge in Ollantaytambo provides clean, basic rooms combined with an excellent location. Only minutes from the train station the hotel makes for a great base after or before your trip to Machu Picchu. Some of the rooms have a private balcony featuring great views of the ruins. 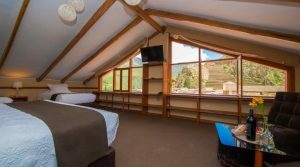 Located on the entrance of the town of Ollantytambo, the Samanapaq provides simple, clean rooms equipped with all basics for those looking to have the convenience of Ollantaytambo and the quietness of the valley. Large gardens invite to stroll around and with some luck see the hummingbirds that often flock here.